The stock of renewable power solutions provider Suzlon Energy plunged more than 24 per cent on Tuesday on debt default rumours. This forced the management to issue a statement denying any debt default or invocation of pledged promoter shares. The share closed at Rs 3.60 on Tuesday, 24 per cent lower from its opening value at Rs 4.8 per share. It fell to an intraday low of Rs 2.7 a share. However, the firm’s clarification helped the share price recover before the session ended. “We wish to clarify the company is regular in servicing its debt obligations, including servicing obligations towards banks and others for January 2019. The rumours about the company are baseless. We appeal to all the investors and stakeholders to not believe the same,” Suzlon said in a statement released to the exchanges on Tuesday. 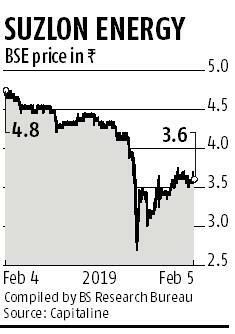 In another separate statement to the exchanges, the company also clarified that none of the promoter shares held in Suzlon have been invoked. “Further, the promoters’ shareholding in the company has been pledged for collaterally securing the obligations of the lenders of the company, and not towards securing promoters’ personal borrowings. The pledge, too, is not mark-to market,” the statement sent to the BSE added. As of December 2018, promoters to the company held 19.79 per cent of its shares, of which 15.18 per cent have been pledged. The company’s debt burden has been a concern, both with the analysts and rating agencies. According to Capitaline data, the company’s total debt was at Rs 10,312.8 crore as of September 2018. It paid an interest cost of Rs 652.79 crore for the September quarter, and an interest cost of Rs 1,581.0 crore for the financial year of 2017-2018, or FY18. CARE Ratings in its November 2018 rating action on Suzlon noted $172 million worth of foreign currency convertible bonds (FCCB) were due for redemption in July this year.” If the same is not converted, there would be additional debt burden on the already tight liquidity position of the company,” the note added. Of the total FCCBs worth $547 million, Suzlon has converted FCCBs of $375 million up to September 30, 2018.